Living with an autoimmune disorder? 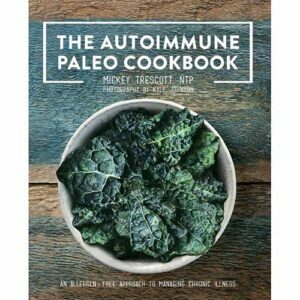 Let’s talk about The Autoimmune Paleo Cookbook by Mickey Trescott and see what you can do to reverse it. It may be hard to believe, but it is absolutely possible to change your future. Thousands of us have done it, and with nothing more “medical” than eating great food and making lifestyle changes. The “basic” Paleo Diet and Lifestyle are an incredible breakthrough in health management. We eliminate foods we never evolved to eat, such as starchy foods that require different enzymes and extra stomach compartments to digest. Since we have no affinity for chemicals and sugars, we simply stop eating them. 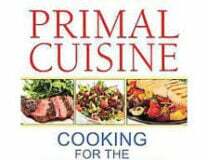 We focus instead on the foods we DID eat for many thousands of years. With a different diet and better sleep, play, attitude and exercise, change can sometimes happen at an astonishing rate. I’ve seen it in myself and I’ve seen it in clients. 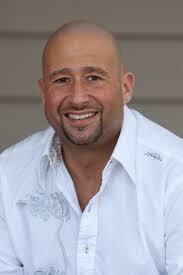 And I’ve read hundreds of stories on websites such as Mark’s Daily Apple, SCD Lifestyle and Robb Wolf. If other folks can do it, so can you! Eliminating foods the body might find inflammatory or allergenic, the Autoimmune Paleo Diet takes us beyond the Paleo Diet. To begin repairing our damaged and inflamed intestines, we also avoid eggs, nightshade vegetables, and nuts and seeds. And here’s where Mickey Trescott’s book can help. Mickey Trescott is a chef, blogger, animal lover and a former vegan. 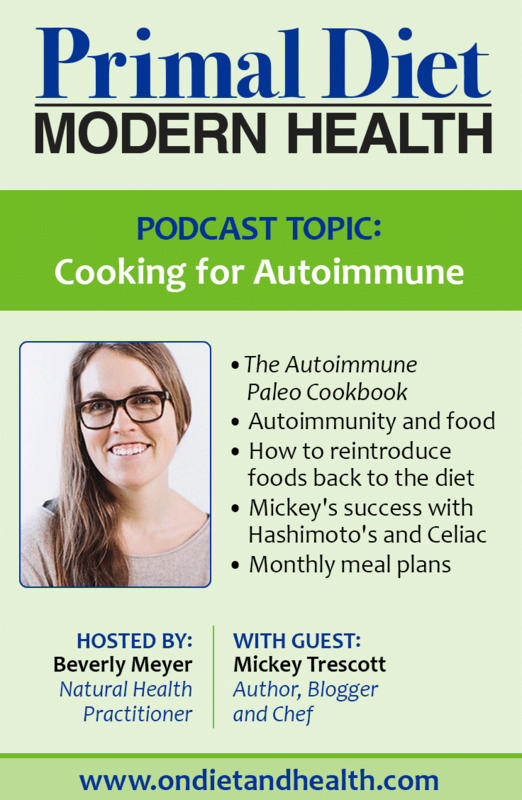 Suffering with Hashimoto’s and Celiac Disease in her early 20’s, Mickey made the transition to a completely different life and diet and joyfully shares her successes on her autoimmune-paleo.com website and blog. 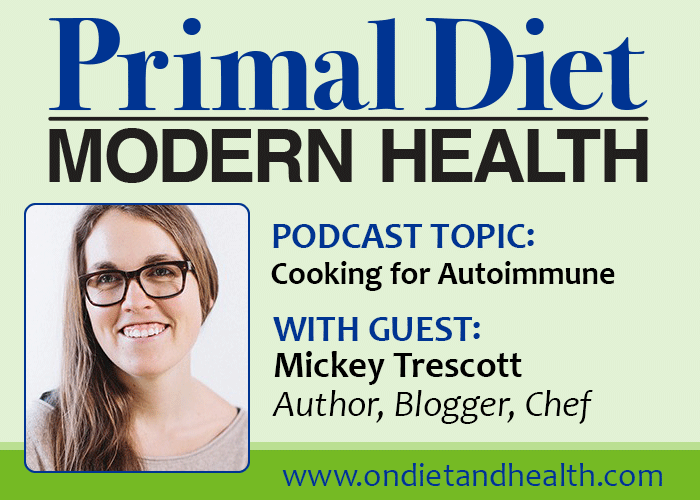 Mickey joined me on my Primal Diet – Modern Health podcast to talk about her beautiful book, “The Autoimmune Paleo Diet Cookbook“. (The podcast link is below to listen in from your computer, or you can go to iTunes to retrieve it). Mickey and I talk about our lives, our passions and our food. And some of our setbacks along the way…. “The Autoimmune Paleo Cookbook” helps you prepare to change your diet and your kitchen. Mickey walks us through the pantry and the shopping and then takes us to wonderful recipes that work for anyone. Mickey also shares advice from Sarah Ballantyne’s autoimmune blog on how to reintroduce foods once your health is greatly changed. As your gut heals, you can try to add foods back, one at a time, starting with the easiest ones first. 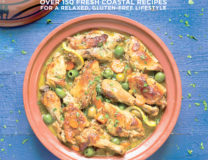 Great recipes that anyone can use, no matter what you eat. Autoimmune doesn’t mean boring! Month-long Meal Plans (two of them!) with recipes and shopping lists. Even if you’re not eating the autoimmune protocol, the Meal Plans are simple, detailed and organized. The book is hard cover and stays open on the counter. One-step-at-a-time instructions on changing your pantry, shopping and cooking. Mickey Trescott will be on a West Coast Book Tour in January and February 2015. Check out her stops here and take some time to meet and chat. You might be the next reader to reverse an autoimmune disorder. Mickey and I did, and so can you! Want to learn more about Leaky Gut and autoimmune disorders? Check out this article on the intestines, autoimmune illness and why they are linked.